Always More to Hear: The Inaugural line-up: What would yours be? I assume that Barack Obama gets a least a little bit of say when choosing the musical and poetic "entertainment" (I put quotations around it because it's WAY more than that) of his presidential inauguration. I mean, it's not a question of "can we get so-and-so" or "too bad whats-her-name will be in Australia". It's the presidential inauguration! And not just any inauguration. I'm already kicking myself for not making a bigger attempt getting to D.C. but, oh well. So who did the Obama people pick to perform tomorrow on the steps of the Capitol Steps tomorrow? Aretha Franklin will be there. A quartet comprising of Yo-Yo Ma (cellist), Itzhak Perlman (violinist), Gabriela Montero (pianist) and Anthony McGill (clarinetist) will be performing an original composition by John Williams. The Boys and Girls Choruses of San Francisco and the Marine Corps Band will also play. We all know about the controversial pick of Pastor Rick Warren to speak. But also we will hear from Elizabeth Alexander (poet) and Reverend Joseph Lowery (civil rights leader). How about some Paul McCartney? He's not American, but he played the Super Bowl once-upon a time didn't he? I mean, that was way more "American" than this is. This is a celebration for the whole world to enjoy. I would definitely get the Soweto Gospel Choir. They are amazing and they represent a country that has seen dark times and is moving toward a brighter future. As for speakers? I wouldn't be able to resist some Jon Stewart. 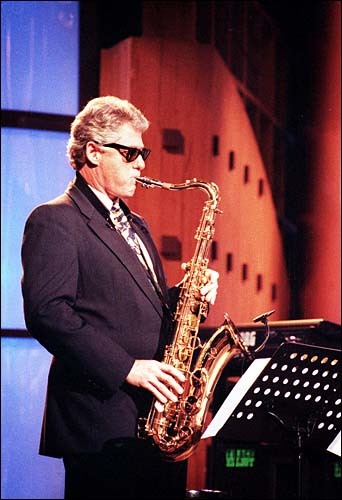 Oh, and Bill Clinton. Definitely. Maybe David Sedaris? Who would be in YOUR inauguration ceremony? UPDATE: How amazing was that ceremony? John William's piece was gorgeous and Reverend Joseph Lowery was incredible as he nodded to whites, black, browns and yellows, Christians, Jews and non-believers (in a humorous and endearing manor. Amen.